Latvian parliament plans to elect deputies to different committees on 20 November, as confirmed by the Saeima Praesidium and Faction Council at a meeting on 8 November. 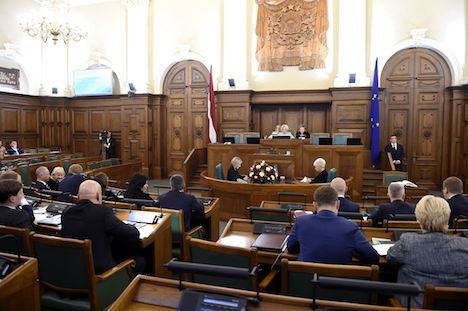 During the meeting, participants also supported a legislative draft regarding rules for the formation of Saeima committees. Saeima plans to approve this legislative draft during the meeting on 13 November. Once this is done, deputies will have to submit candidates for committees to Saeima deputy secretary Marija Golubeva by 17:00 on 15 November. The Saeima will decide on election of deputies in committees on 20 November. BNN had previously reported that two political parties have been left out of Saeima Praesidium: KPV LV and the Union of Greens and Farmers. Ināra Mūrniece from the National Alliance was re-elected as the speaker of the Saeima: 44 deputies voted in her favour and 32 voted against. Dagmāra Beitnere-Le Galla was elected as deputy Saeima speaker. 65 deputies voted in her favour and 34 voted against. With 65 votes in favour and 31 votes against, Inese Lībiņa-Egnere from New Unity was elected to 13th Saeima Praesidium as second deputy speaker. Andrejs Klementjevs from Harmony was also elected Saeima secretary(55 votes in favour and 32 against). Marija Golubeva from Attīstībai/Par! was elected as the Saeima deputy secretary with 64 votes in favour and 34 against.